Administrative Professionals Day (AKA Secretaries Day) is the time when those in charge show appreciation to their staff for all they do to keep everything running smoothly. Let's face it, without a good team behind you it would not be business as usual! Let us deliver the best in administrative professionals day gifts to your staff -- from beautiful flowers to gift baskets filled with yummy snacks, you can't go wrong with Robynn's Nest Flowers & Gifts! Send mom your love this year through a beautiful bouquet of her favorite flowers. Mother's Day is your time to show mom just how much you appreciate her and everything she has done. Let Robynn's Nest Flowers & Gifts help you say "Thinking of you, mom" and "I love you always" with flowers -- no matter if you live here in Flagstaff, or across the country. Simply click any of the beautiful Mother's Day flower arrangements above to order online! We all know people who go out of their way to do wonderful things for others and never expect anything in return. Sweetest Day is THE DAY to show them how much you appreciate them. Nothing satisfies a sweet tooth like a gift basket full of yummy snacks. Robynn's Nest Flowers & Gifts in Flagstaff can help you select the right sweets for your sweetie this Sweetest Day! I know what you're thinking, "Flowers for Halloween?" You might be surprised at what creative florists have up their sleeve. Let our experts help you plan your Halloween decorations and haunted houses. From your front door wreath, to your ghoulishly gorgeous centerpiece, Robynn's Nest Flowers & Gifts will help you turn your Halloween get-together into a Halloween party no one will ever forget. Fall is a favorite time for flowers. The colors of autumn abound during this beautiful season of Thanksgiving. 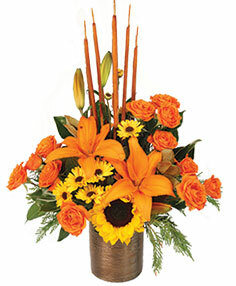 Let Robynn's Nest Flowers & Gifts help you bring this color into your home with the help of autumn flowers. With the simple addition of flowers on your Thanksgiving table, your family dinner will transform into a glorious Thanksgiving feast! Robynn's Nest Flowers & Gifts in Flagstaff can help you say "I am thankful for you," to any friends and family who are unable to make it to your house for the holiday. Just give us a call, we are thankful for you. Nothing says "I Love You" more clearly than sending roses on Valentines Day. Whether it's a first date, first anniversary or the fiftieth, Robynn's Nest Flowers & Gifts can help you find the perfect gift for your sweetheart on this Day of Love. Don't forget to show your friends and family some love too with a special delivery from Robynn's Nest Flowers & Gifts. Browse our Valentines Day flowers online or call us for custom creation. No matter where you need to send roses, Robynn's Nest Flowers & Gifts in Flagstaff can help!